This is a really nice dish. Where else can you find bits of pineapple chunks in your meal? Very tropical. 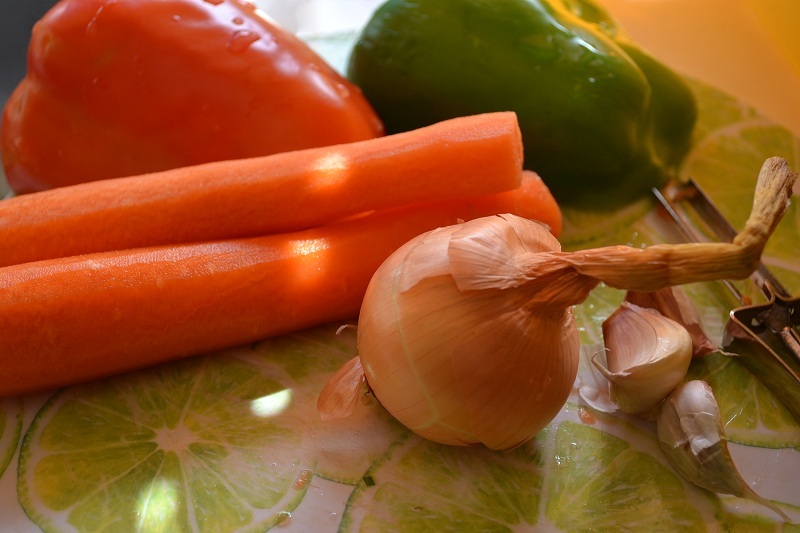 The sweet and sour combination can be a bit tricky though, but what we are looking for is the sweetness first, and then we get a hint of the sour taste. We initially settled on trying to balance it out using vinegar, sugar, and pineapple but the last minute addition of ketchup worked really great (and it added a nice colour to the sauce). Also, you may deviate from the measurements listed in the ingredients list, depending on your taste. 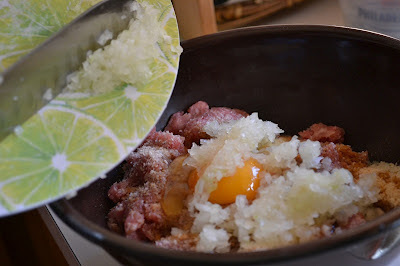 For the meatballs: In a bowl, combine the minced pork, breadcrumbs, egg, finely chopped onions, and seasoned with salt and pepper. Mix thoroughly. Refrigerate for an hour. Get a heaping spoonful per scoop and shape into balls. 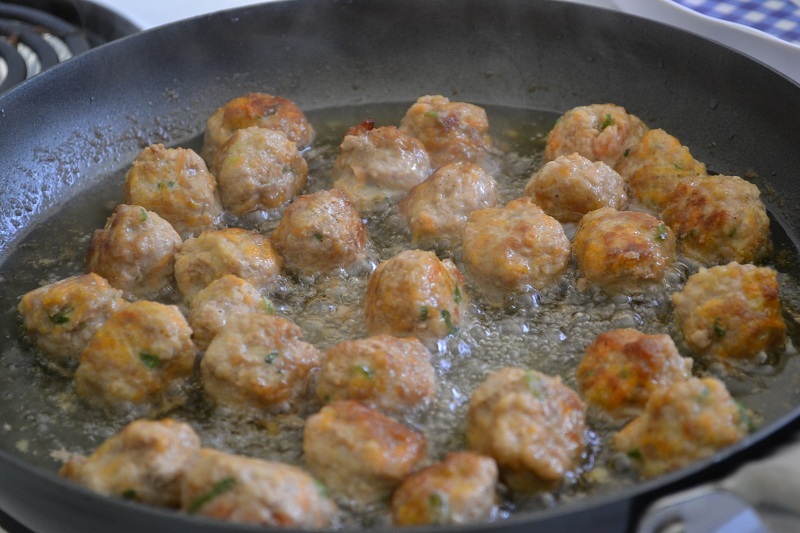 Heat up a sufficient amount of cooking oil for the meatballs to properly cook in (you can deep fry if you wish) over medium heat. Cook the meatballs until browned on all sides. Which reminds me of a riddle. How many sides does a ball have? The answer at the end of this article! 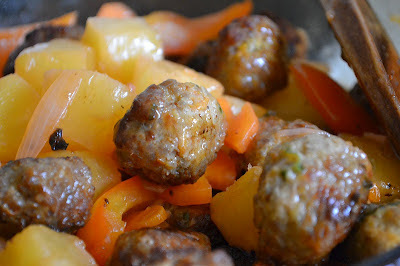 Set aside cooked meatballs on paper towels to drain off excess oil. In a pot, heat up some cooking oil over medium heat. 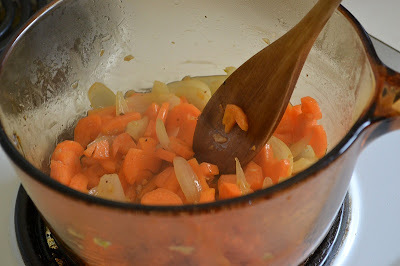 Add the carrots and cook for around 2 minutes. 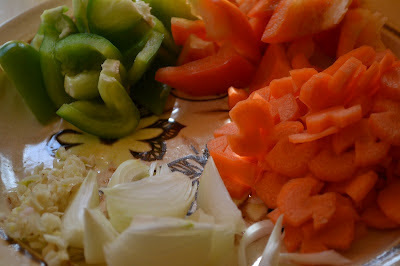 Then add the capsicum pieces, mix, and cook for a minute. Add 1 tbsp sugar, pineapple chunks and syrup and mix. If there's too little syrup, add water. Ideally the liquid level is 3/4 of the solid ingredients. 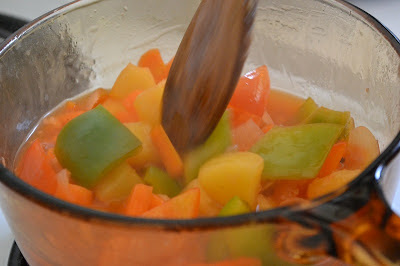 When it starts to boil, add the vinegar. Do not mix until the vinegar smell has mellowed. Time to taste! Check the sauce for sweetness and sour. The pineapple will and vinegar will contribute a lot to the sour taste, so try to check the sweet component. The ketchup should help here. If not, try adding a bit more sugar. Finally, add in the meatballs. Serve immediately with hot rice. And the answer to the riddle: 2! Inside and outside!